^ 1.00 1.01 1.02 1.03 1.04 1.05 1.06 1.07 1.08 1.09 1.10 George M. Dunnavan; John W. Dierks. An Analysis of Super Typhoon Tip (October 1979) (PDF). Monthly Weather Review (Joint Typhoon Warning Center). 1980, 108 (II): 1915–1923 [2015-01-13]. ISSN 1520-0493. doi:10.1175/1520-0493(1980)108<1915:AAOSTT>2.0.CO;2. ^ 2.0 2.1 2.2 2.3 2.4 Japan Meteorological Agency. Best Track for Western North Pacific Tropical Cyclones. 2010-01-12 [2010-01-12]. （原始内容 (TXT)存档于2013-06-25）. ^ 3.0 3.1 3.2 Debi Iacovelli; Tim Vasquez. Marthin S. Baron, 编. Super Typhoon Tip: Shattering all records (PDF). Mariners Weather Log (Voluntary Observing Ship Project). 1998-08, 42 (2): 4–8 [2015-01-14]. ISSN 0025-3367. （原始内容存档 (PDF)于2013-11-24）. ^ 4.0 4.1 4.2 History of the U.S. Naval Mobile Construction Battalion FOUR. U.S. Naval Construction Force. 2004 [2007-01-25]. （原始内容存档于2007-02-05）. ^ 5.0 5.1 5.2 Camp Fuji Fire Memorial. United States Marine Corps. 2006-08-03 [2007-01-25]. （原始内容存档于2009-08-05）. ^ Second U.S. Marine Dies In Typhoon-Caused Fire. The Washington Post. 1979-10-20. ^ Marine Killed in Japanese Typhooe [sic]. The Washington Post. 1979-10-20. ^ 1 Marine Killed as Typhoon Hits Facility in Japan. Palm Beach Post. 1979-10-20. ^ 25 are killed as Typhoon Tip crosses Japan. The Globe and Mail. Reuters. 1979-10-20. ^ International News. Associated Press. 1979-10-19. ^ International News. Associated Press. 1979-10-18. ^ International News. Associated Press. 1979-10-22. ^ National Weather Service Southern Region Headquarters. 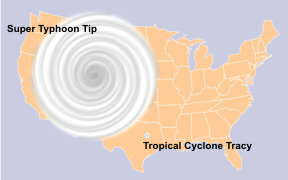 Tropical Cyclone Structure|2010-01-05. JetStream - Online School for Weather. National Oceanic and Atmospheric Administration. [2015-01-14]. （原始内容存档于2014-11-11）. ^ Bryan Norcross. Hurricane Almanac: The Essential Guide to Storms Past, Present, and Future. St. Martin's Press. 2007: 76. ISBN 0-312-37152-7. ^ Steve Stone. Rare Category 5 hurricane is history in the making. The Virginia Pilot. 2005-09-22 [2015-01-14]. （原始内容存档于2014-10-26）. ^ M. Ragheb. Natural Disasters and Man made Accidents (PDF). University of Illinois at Urbana-Champaign. 2011-09-25 [2009-03-26]. （原始内容 (PDF)存档于2009-03-26）. ^ Jay Barnes. Florida's Hurricane History. Chapel Hill Press. 2007: 15. ISBN 0-8078-3068-2. ^ National Weather Service. Super Typhoon Tip. National Oceanic and Atmospheric Administration. 2005 [2011-10-06]. （原始内容存档于2011-10-06）. ^ 19.0 19.1 Karl Hoarau; Gary Padgett; Jean-Paul Hoarau. Have there been any typhoons stronger than Super Typhoon Tip? (PDF). 26th Conference on Hurricanes and Tropical Meteorology. Miami, Florida: American Meteorological Society. 2004 [2015-01-14]. （原始内容存档 (PDF)于2014-10-22）. ^ Satellite Services Division. Typhoon 31W. National Environmental Satellite, Data, and Information Service. 2013 [2015-01-15]. （原始内容存档于2013-11-11）.